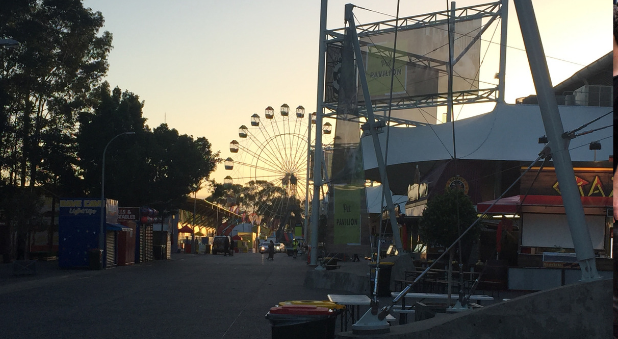 When you’re enjoying the rides, the animals and the festivities of the Easter Show, do you give much thought to the people behind the scenes? John, the missions pastor at Church@thePeak in Peakhurst, has been caring for those who make up the backbone of the Sydney Royal Easter Show since 2015, running church services, praying and chatting. He says it is a privilege to get to know the sacrificial men and women who make it possible for us to enjoy the annual pluto pups and farmyard fun of the show. “One of the big things you notice is that these are hard working people who give their lives so other people can have enjoyment,” he says. “It’s really unique. They choose to travel around Australia, have hassles, struggle to pay debt, so they can be at the Easter Show for two weeks so families can come and enjoy themselves. "I am constantly struck by the self-sacrifice of this community and share that with them, and try to relate Christ to them because he was the same"
For the duration of the show, John and a small team of volunteers arrive at 6.30am daily. They walk through the grounds building relationships and listening to people’s stories. “What I saw were people who travelled 11 months of the year and had no one to talk to about anything spiritual,” he says. They also run two short church services on Easter Sunday, so that even those hard at work can take time to celebrate the death and resurrection of Christ. His approach to caring for people is simple. “I don’t ask stupid questions,” he says. “I ask ‘How’s life?’ I’ve got five minutes with this person, if I’m lucky I might get up to 20. I asked one lady at the start of last year, ‘How was your month off?’ and she said, ‘I couldn’t wait to get back on the road’. Her life is hard and her month off is a nightmare. What kind of hope is that for her life? “There is joy in sharing that there is hope beyond this world and Christ is a king who loves her and knows her suffering. There are lots of these conversations. These are now friends I care about, so for the rest of the year I pray regularly for these people. "There are lots of these conversations"